ArcNews Fall 2003 Issue -- What Is a Segmentation System? What Is a Segmentation System? Segmentation systems, such as ACORN, help companies profile their best customers and prospect future clients. Following each decennial census, the models that produce segmentation systems are rebuilt and reconfigured to reflect society's changing demographics. 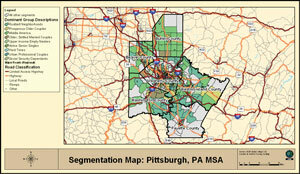 A segmentation system classifies and describes American households and provides a demographic map for any area in the United States. The decennial census is the largest source of demographic data for the United States. However, a segmentation system provides a more powerful discriminator of consumer behavior than pure demographic measures and reduces massive databases supplied by the U.S. Bureau of the Census to a simple system of classification. It also supplies a common reference point to compare different neighborhoods within a city, a state, region, or the entire country. Segmentation systems operate on the theory that neighborhoods with similar demographic characteristics have similar tastes, lifestyles, and consumer behavior. These behaviors are measurable and predictable and, therefore, can be targeted. In fact, for many years companies, agencies, and organizations have been using segmentation systems, such as ACORN, to divide and group their targeted markets to more precisely target only their best customers and prospects. Learn more about the methodology used to build Community Tapestry at www.esribis.com/tapestry. See also "Community Tapestry": A New System for Geodemographic Analysis".